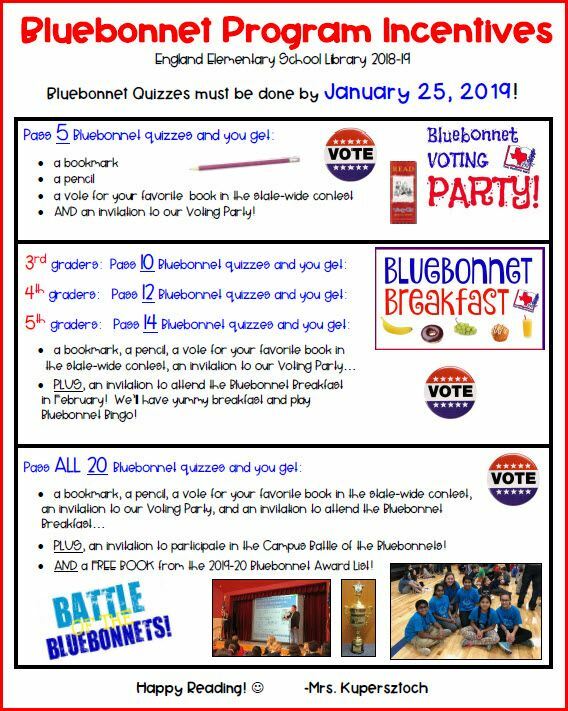 England’s Texas Bluebonnet Award Program ENDS on January 25, 2019! Reading and writing book reports are fun and helps you with your writing skills! I love Ivy and Bean books!!! 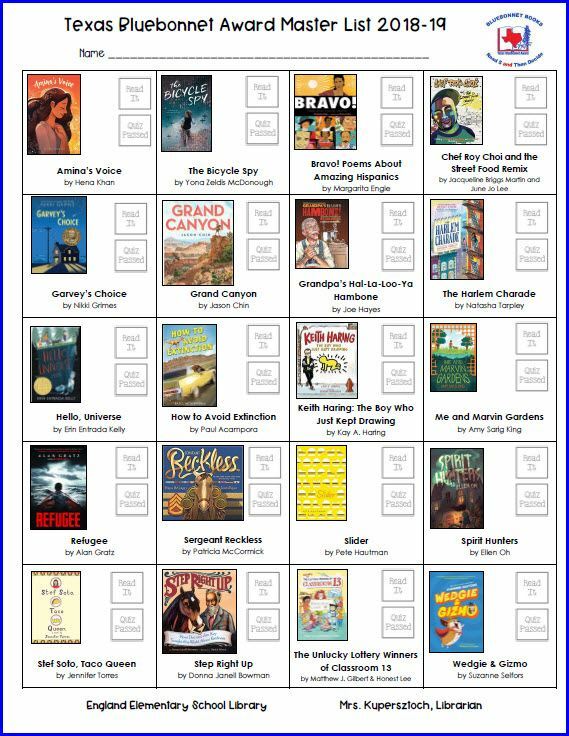 I loved all the bluebonnet books, they were all amazing this year! Especially Wonder!!! You’re right Claire, Wonder is a fabulous book. Hope I get chosen to see R. J. Palacio talk about her book! It is good that we have the charts to look at so we can remember which reports we did if we are not very organized. I can’t wait to do the bluebonnet reports. I LOVE THESE BLUE BONNET BOOKS! Blue Bonnet books are awesome. Mrs. Kupersztoch I think that you should put up the tracking sheet that tells you what books you passed on the quiz because I read 19 of the bluebonnet books and I forgot how many and what quizzes I passed on. Bluebonnet Books are amazing! The story’s are sooooooooooooooooooooooooooooooooooooooooo good. Mrs. Kupersztoch I want to read all 20 Bluebonnet books. I was wondering when that was due. I am the librarian at a school in McKinney. Did you create the quiz for each of the books? I’d love to know more about your program!